Having now visited the Sharpe-Walentas year long studio program five times, I still can't figure out how artists adapt so quickly to a new space, like a hermit crab crawling into a new shell. I guess it is inherent to our species. Yevgeniya Baras' studio, which she has been in for a month now, felt as intimate and unadulterated as many of the moments in her paintings. When I came by, she was preparing work for NADA Miami where she will show with Nicelle Beauchene. 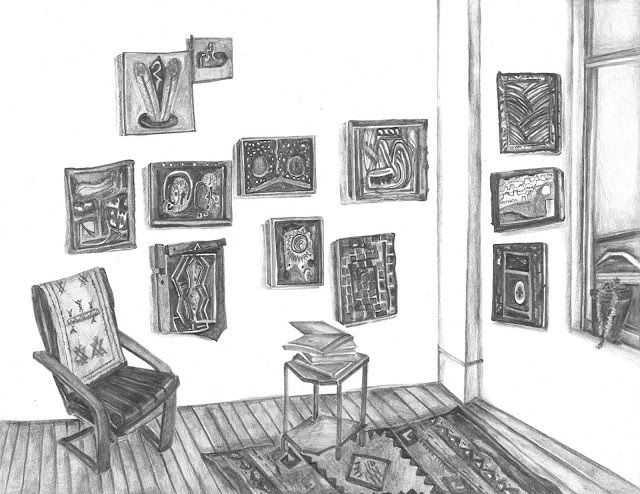 In their varying stages of production, Baras' paintings are each delegated a space, along with her finished pieces that hung collectively on the corner wall. That corner, complete with a lounge chair, rug, and view of the Brooklyn Bridge, was the most obvious and perfect spot for me to draw. Baras' painted lines, tactile textural build up, and recurring color themes carry through from one work to the next, but for the most part each painting exists in a category of its own. They bring to mind the stream of consciousness marks on Miro's canvases, or the early cubist constructions that broke the confines of reality and convention. Baras is also breaking out of the obvious limitations of a stretched canvas by using bedsheets as her fabric and reversing her stretchers so that the bars become a part of the composition. In one instance, she has even attached a smaller painting to a larger one for a new take on the diptych. The sense of freedom that I get from not only seeing the work, but also imagining her experience making it, gives me endless pleasure.